Teachers should fall into Christmas shopping lists almost like family. Their time, effort and patience is invaluable and you can especially show your appreciation during the holidays. Here are a variety of hassle-free ideas for every kind of teacher out there. While you may want to do something yourself or have your kids craft up a gift that their teacher will love, there are those who prefer to go the purchasing route. Don’t forget to pick a gift your can personalize, like jewelry or office supplies, to say thanks. Whether it’s a meeting or simple notes taken in the classroom, gift your teacher a stylish woodgrain monogram journal that’ll have everyone glancing over. Pick an option that best suits their style, like bright patterns or include a photo of the classroom print on it. Papers can be caught flying around in classrooms, help the teacher keep it together with a paperweight that captures the spirit of the class in one shot. For all those challenging days, give them something to smile about. A desktop plaque that reminds them of how great they are can fit on their desk or at their home. Include an uplifting message for those extra rough mornings. You can never go wrong with a gift that’s as practical and needed as a desktop calendar designed like an easel. This stylish take on the traditional monthly calendar will make it easier for them to order replacements for the new school year. Show your appreciation with a thoughtful gift that can be used everyday, the silver initial necklace. Include their initial or the first letter of your child’s name. Every teacher needs a goodie jar, personalize it with their name and it’s sure to become the talk of the school. Fill the jar with favorite candies or school supplies like fun pencils, erasers and more. Save the day with the stainless steel travel mug that gets their coffee or tea to and from school as if freshly brewed. Include a gift card to their favorite cafe or artisanal coffee beans. Capture the school year’s most outstanding moment and turn it into a puzzle masterpiece. Make it hard for older classrooms or easy for younger ages so the teacher can use it as a rainy day activity. How fun are magnetic boards? Include a thoughtful letter, photos and a gift card pinned to the board. Your teacher will thank you for this bright idea! There’s nothing cozier than a fleece blanket for your favorite teacher to snuggle in during the holidays. Pick a fun pattern or a photo of the classroom for them to also use it during recess. They work hard all year long to make sure your kids bring the cutest crafts home. Now it’s your turn, have your kids get crafty with a beads bread bowl that will surely stand out. Beeswax candles are an easy DIY kind of gift that go a long way when you want to impress more than one of your teachers with thoughtfulness. Try putting them in a decorative mason jar and pairing with a spa gift card for ultimate relaxation. Everyone’s into growing plants and vegetables these days. Garden markers adorn any garden and are simple to make. Include seed packets or a small collection of potted herbs for them to get started. Has your teacher been caught with chocolate in their hands? Maybe an emergency chocolate case is what they need. This is a fun gift you’ll actually enjoy making. Show them you care by preparing a survival kit that will get them through the winter days. 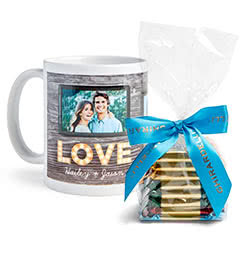 Hot cocoa and a cookie mix are a must, but you can also include decorative cookie cutters, a cozy scarf and more. If you’re into making things, then the post-it holder project is one your teacher will thank you for. Don’t forget to supply them with some more sticky notes and other office supplies, like pens and paper clips. Your teacher prefers tea over coffee, don’t fret. Giving a tea Christmas tree has never been cuter or more original. Try a variety of different flavors that they may have not tasted yet. Get creative and come up with cute phrases for gift tags that let your talent show. Or try the catchy phrase in this sweet pancake mix gift bag. Whether you choose from thoughtful Merry Christmas wishes or short holiday sayings, your teacher will appreciate this element of customization. Offer a little bit of warmth with that gift card by making your own card holder envelope. Use a simple pattern like polka dots or pick a stamp from your local craft store. A mason jar supply organizer is the ultimate old school gift that keeps the desk neat and pretty. Include their name or the year of the graduating class. Classrooms can definitely use a little bit of a holiday scent, give an oil room spray that’ll keep the Christmas spirit alive. The candy cane sleigh is cute, easy and inexpensive to give. Not a sugar fan? Substitute granola bars, gum and fruit leather for a healthier option. Personalize their crayon box with fun patterns or designs. Make it extra special by having your child color on the box or include a heartfelt thanks with a gift card for school supplies. There are a variety of ways you can turn your kid’s artwork into gifts that are perfect for a teacher.